Welcome to this month's Stampin' Dreams Blog Hop. You are currently visiting Stephanie Fischer from Australia. I hope you enjoy my project with the Theme: Favourite Technique. Please remember to click on the next person in the line up at the end of my post to continue enjoying all the wonderful projects in the hop. I really love to paint and colour - and a technique that has given me a lot of pleasure over the years is to paint a stamped image as a monochrome. In the past I've always used watercolouring (examples here and here) but for this hop I decided to extend myself a bit and try using the wonderful new Stampin' Blends alcohol markers to achieve a similar result. 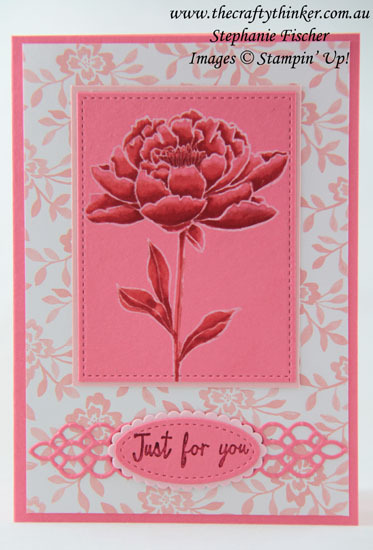 If you're wondering about that gorgeous lacy die cut - it's a sneak peek of a die in the new Petals & More thinlits set. I started out with a piece of Flirty Flamingo cardstock with the You've Got This flower stamped in Whisper White Craft Ink. 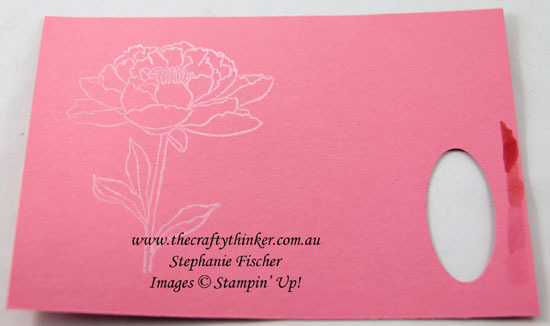 I then coloured the flower using the Stampin' Blends in Pink Pirouette Light, Calypso Coral Light and Calypso Coral Dark. I cut the flower out with a square Stitched Framelit (using this technique to extend the shape) and layered it onto a piece of Powder Pink cardstock. The base card is Flirty Flamingo with a layer of the Fresh Florals Designer Series Paper in Powder Pink. I used Flirty Flamingo cardstock and one of the new dies in the Petals & More Thinlits (sneak peek!) to create the lovely lacy strip and added a label made with Powder Pink and Flirty Flamingo cardstock and the Stitched Shapes and Layering Ovals dies. The greeting is from the Watercolor Wings stamp set using Cherry Cobbler ink, stamped off. I hope this project may have inspired you & brightened your day. You are currently visiting Stephanie Fischer. Please hop through all of the people on the list below to see all of our projects. You don't want to miss any!